"After 20 years, I finally decided to have my living room, dining room, and kitchen repainted. I was very nervous about picking the colors and Anthony was a patient pro about the whole thing. I love the colors 'we' picked and all three room colors complement each other. Everything looks great." Create the home of your dreams with our expert home interior painters. Let us help you find the best paint choices with our color consultation and testing services. Our company is fully insured and 100% committed to your total satisfaction. Chicago foyer painting with drama and panache. Cabinet restoration, too! Selecting the right neutral shade of paint accentuates the natural elements in this LEED Certified, new construction home. Dazzling red panels and dramatic wood stain for the dining table at this popular Evanston restaurant. Add fun and excitement to a kids' bedroom paint job. Vaulted ceilings let in the light as our pro painters precisely trim out the natural beams and light fixtures. Brighten your kitchen! Dynamic Colors Inc. can remove that dingy wallpaper and freshen up walls, doors and windows with a new hue. High-ceiling drama and exposed beams highlight this living room painting project. Our interior house painters take extra care with details like French doors, decorative moulding and other architectural features. Preparation is key in every home painting project. Our team covers it all from floor to chandelier. Your options go far beyond just a paint color. Different treatments can make a room appear larger or inspire new uses. Your walls don't have to be one color, either! Brightening up the training center at the Evanston ReBuilding Warehouse. Freshen up that vintage bathroom with crisp white trim and soft pastels. Getting the balance right is a breeze with Dynamic Colors. These bold stripes are precise and make an impact! Every room is different and requires special care when it's time to paint or remodel. So many fun colors and ideas for painting a child's room. 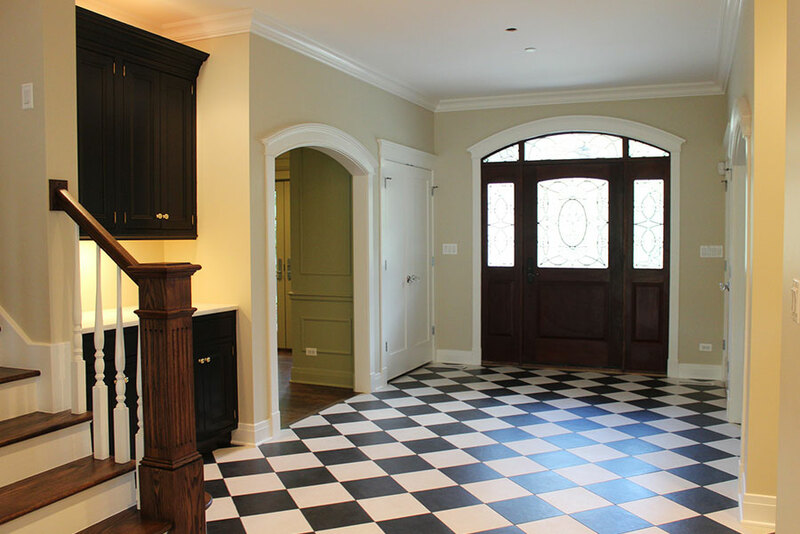 Checkerboard and stripe patterns are just some of your options.